A hyper scalable platform, myplex comes with all the contemporary features like DRM, ABR, billing suite & recommendation engine. We are the one stop plug and play solution you should be considering! 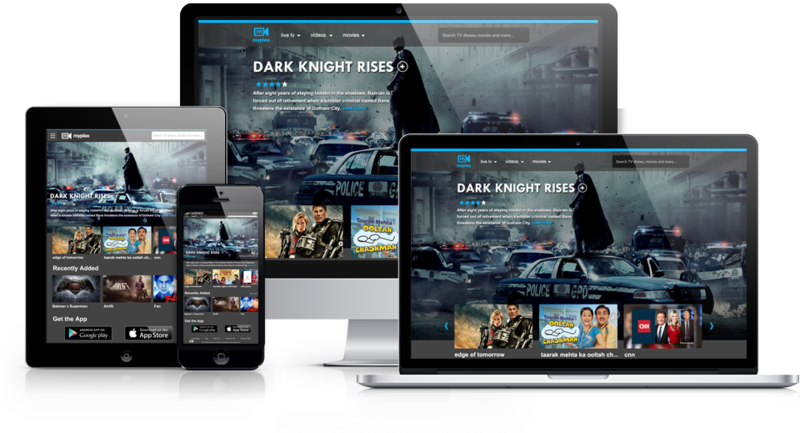 We use the world class DRM solutions of Google Widevine classic and modular to securely broadcast your content over Mobiles, Tablets, PCs, Smart TVs, Chromecast, Set top boxes and Android boxes. Content is streamed on the best in class Exo player and has inbuilt HLS/ABR support. Beautiful aesthetics and intuitive UI makes content discovery very easy. Personalize your content offerings based on user properties and behavior using our customized recommendation engine. Engagement module includes language localization, Elastic search, and vernacular notifications giving the best user experience. Versatile payment options – Debit/Credit card/Net banking, 3rd party wallets, Telco billing, Custom wallets, Apple payments etc can be seamlessly integrated across devices. Manage your business model through our customized billing packages like Subscriptions, freemium, coupons, pay per view, Pay per download etc. Beautifully integrated Inapp purchases and Video ads offer an awesome user journey through the App. Unleash the power of data to understand the deep rabbit hole of customer engagement. Our myplex suite comes integrated with a custom report generation tool which manages your Acquisitions, Subscriptions, content reports, Usage and behavior, segmentation and retention. You can even control your insights further by adding 3rd party analytical tools like Google Analytics, Mixpanel, Appsflyer etc as required. With deployments in over 2 dozen telcos, our Mobile TV has proven to be the most trusted platform globally. Our expertise lies in the deep understanding of the market, planning and aggregating content, strategizing and delivering the product for the best user experience. Choose how you want to broadcast content – APP or WAP? Our platform is optimized to deliver content across all the Mobile Operating Systems – Android, Windows, Symbian, IOS, Blackberry, Bada etc which is optimized through adaptive broadcasting for seamless viewing even in challenging situations. We have worked with more than 40 media owners broadcasting 120+ channels, Movies and Videos. We not only bring our content partners on board, we also help you understand the audience, plan and aggregate content best suited for maximized engagement. 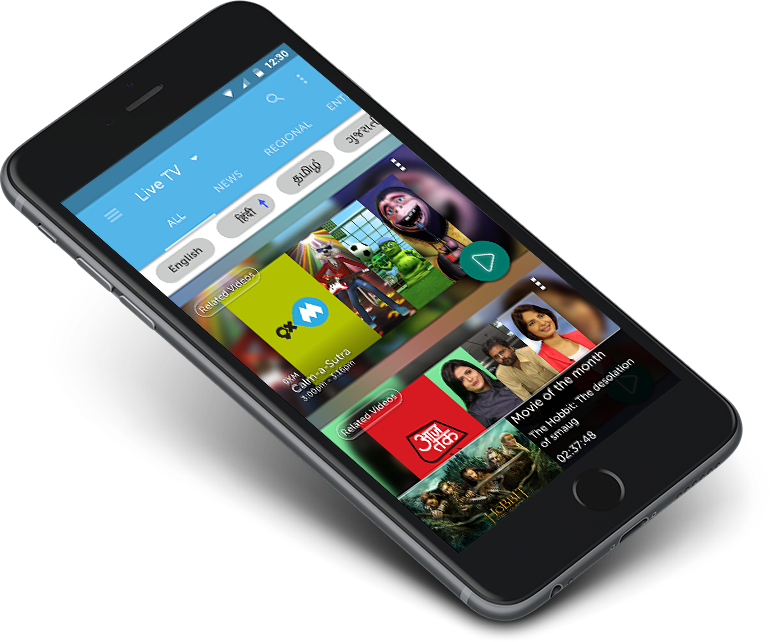 Mobile TV & VOD platform comes fully loaded with features like EPG, DVR, Catch up TV integration, Timeshift, Multiple language support and Adaptive bit rate technology. Navigation and browsing becomes very simple with elastic search and simplified user interface. Your audience loves to watch short videos? Package everything in your mobile TV platform, now integrate 3rd party and you tube videos with ease. You can create differential pricing and the platform support VOD downloads and scheduled downloads options too!